View our event calendar to find a class or support group near you. Call (859) 288-2446 for more information or to register for a class. Healthy Living with Diabetes (comprehensive diabetes education program): Join this 4-week series to learn the latest on managing diabetes. Led by Certified Diabetes Educators and Registered Dietitians. Topics covered in this nationally accredited curriculum include: healthy eating, being active, taking medications, monitoring, healthy coping, problem solving, and reducing risks. Diabetes Basics classes (general overview classes): These 2-hour classes led by Certified Diabetes Educators provide an overview of core diabetes self-management education topics. Gestational Diabetes classes: For those diagnosed with gestational diabetes (diabetes in pregnancy). Weekly classes are led by Registered Dietitians and Certified Diabetes Educators to provide evidence-based guidance on managing gestational diabetes. Nutrition Basics classes: These 2-hour classes led by Registered Dietitians and Certified Diabetes Educators provide an overview of the core diabetes nutrition guidelines and recommendations. Individualized nutrition counseling: Call (859) 288-2446 to schedule an appointment with a Registered Dietitian for personalized guidance on healthy eating or managing certain health conditions. Phone consults: Have a quick question about diabetes, prediabetes, or eating healthy? Call (859) 288-2446 and ask to speak to one of our Registered Dietitians or Certified Diabetes Educators. Presentations and screening for community groups: Looking for an engaging speaker to share cutting edge information with your group on diabetes, prediabetes, diabetes prevention, heart health, or healthy eating? Interested in diabetes screening? Certified Diabetes Educators, Registered Dietitians, and Health Educators are available to assist. Free health education resources: A variety of health education displays, props, and presentations are available to borrow at no charge. They book up months in advance. Call (859) 288-2446 to inquire about or reserve current available resources. Diabetes Prevention Program (comprehensive year-long program): A year-long program providing education and support for individuals with prediabetes in their efforts to delay or prevent development of type 2 diabetes. Utilizes a national curriculum. Meets weekly for four months, then biweekly for two months, and monthly for the final six months. Led by a Health Educator and Registered Dietitian. Prediabetes classes: These 2-hour classes provide an overview of core lifestyle change behaviors that may delay or prevent development of type 2 diabetes. Utilizes a state approved curriculum. 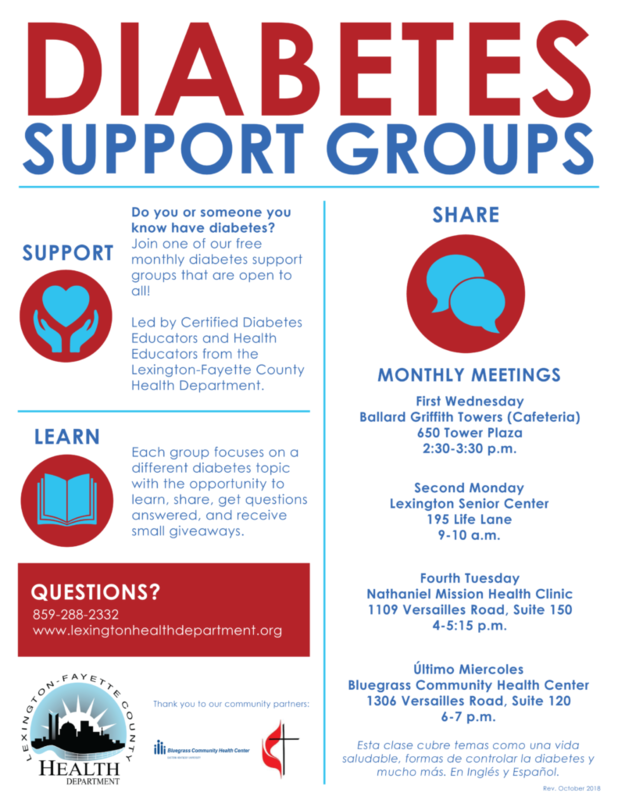 Diabetes support groups: The monthly support groups throughout the community focus around a diabetes-related self-management topic with the opportunity for sharing and getting questions addressed. One group is Spanish-speaking. View our event calendar to find support group or class. Eat, Move, Lose weight loss support group: The monthly weight loss support group focuses around a weight management related topic with the opportunity for sharing and getting questions addressed. Participate in local and statewide diabetes coalitions: Work together with others in the community to raise awareness about diabetes and diabetes prevention.